On Monday, February 6th the People's Climate Movement held a conference call in support of the 100 Day Mobilization event that is planned for April 29th. There were more than 1000 people that participated. During the hour-long teleconference, different speakers reviewed the following four topics: 1. The current political climate 2. A review of the People's Climate Movement 3. Updates for the March on April 29th 4. digital support, strategies, and tools. One of the positive developments that emerged from this call was a report on the growing unity between various groups with differing priorities and agendas. In an effort to combat the current administration Democrats appear to have healed divisions and various non-political groups have put their ideological differences aside for the same reason. One of the speakers specifically addressed the coming together of groups that support environmental issues and those who support racial and economic justice. These groups are now unified in support of this event. Throughout the call, we were repeatedly polled as to our level of participation in various protests. A significant majority of those present for the call had participated in protests including the Women's March on January 21. People who participated in the call included those who support the Science March that is scheduled to take place just ahead of the 100 Day Mobilization event on April 29th. Those who voiced their views shared the common perception that protest is an important and necessary response to the Trump administration. The call started with an explanation that the April 29th March was originally meant to push Hilary Clinton to be more proactive on climate change. Now the focus has shifted in the wake of Trump's upset. We are now facing "one of the most challenging times in our lives," the first speaker said. A cascade of serious assaults on climate and the environment have already occurred and many more are expected from this administration. The People's Climate Movement grew out of the People's Climate March in October 2014. Since then the movement has been growing and there is now a broad coalition unified in the resistance to Trump. The organizers said they are focused on both climate and economic justice. The plan is to "resist" than to "rise" with a plan of action. This is about communicating the veracity of climate change but it is also about actions that can slow or stop Trump's assault on the planet and its inhabitants. The goal is to build a large enough coalition to win and this entails diversity. That is why those with climate concerns are coming together with those who are seeking racial and economic justice. The People's Climate Movement has staged and supported protests, vigils, and actions since the 2014 event. They are building local infrastructure and support for actions. They know that addressing climate change is a long-term struggle, so this effort is intended to endure well beyond the April 29th event. Some of the action design issues currently being discussed include feeder marches, incorporating art and culture. Organizers are also looking at the possibility of a week of events including the Science March and satellite marches and actions. However, they emphasize that the march in Washington will be the centerpiece of this action. There is a need for people to support the effort in the following areas, bus captains (to get people to Washington), leaders of local mobilization, graphic design, video, sharing through word of mouth, and op-eds. This is not just a one-day march goal is to unite a broad-based group of community organizations. This includes climate justice and support for cleantech jobs. Perhaps the most important role of the People's Climate March movement is in connecting groups locally to prepared for the April 29th event and to address future challenges. The call concluded with a review of some forthcoming digital tools in support of the 100 Day Mobilization event. Among the things that will be rolled out onto the site, there will be a map where you can find local events in support of the April 29th protest. If you want to add your event to the map contact charlie.furman@peoplesclimate.org. 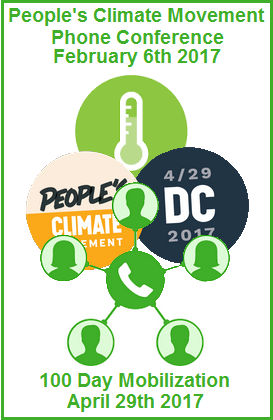 If you want to get involved or help to organize a local event go to peoplesclimate.org (please share this link widely). The Green Market Oracle is a partner of the People Climate Movement and will be covering all developments up to and beyond the event on April 29th.